So Thor is to be a woman, Captain America is to be African-American, Spiderman Hispanic, Ms Marvel Pakistani (I prefer the ungendered ‘Captain Marvel’ title to ‘Ms Marvel’, but we shall press on), and other similar flippings and re-imaginings are bringing a new sense of diversity to familiar comic heroes. And to my own surprise, I am conflicted. I should be all for this… but. Let me say from the outset, I want comics to diversify and tell the stories of people who are not straight, white guys. I want more stories with protagonists of colour. I want my sons to see superheroes that reflect the world they live in, populated as it is by shades of brown, by more women than men, by the rich traditions of cultures from around the globe. I’ve written here about diversity in storytelling before. I love the idea of a female superhero flying in, swinging a hammer, sending lightning to strike her foes, in a superheroic role that don’t require skin-tight black leather, cleavage-bearing cut-outs or bikini line waxing. I was raised by Buffy. 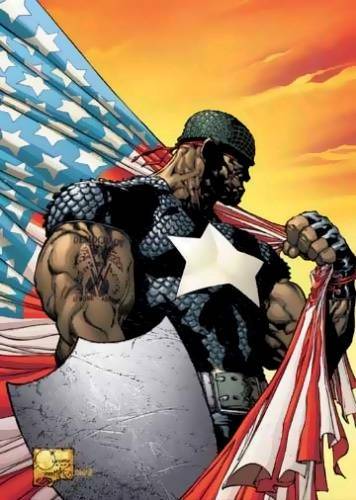 On top of this, Falcon is the obvious candidate to take-up the star-spangled shield if Steve Rogers’ serum were to fail him, and an African-American Captain America should be unremarkable in an America where Obama is president, for readers who have grown-up admiring athletes like Jordan, Shaq and LeBron. And yet I am conflicted by these changes. For all those reasons I have to support them, something grates. I worried initially that this was some vestigial cultural rejection, that some part of me was stamping its feet and saying ‘Thor is a man because he just is dammit!’ But I don’t think that’s what this is. 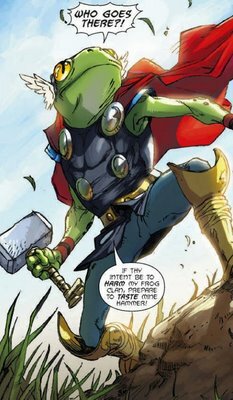 After all, much has been of Thor’s time as a frog, for a time Captain America was a Skrull, Superman has been a gorilla, etc. These passed unremarked, as they should have, and perhaps as these changes should too. I think instead that my conflict comes from concern that these well-intentioned changes don’t actually achieve the message they intend. These changes are not tokenism – as Chuck Wendig’s excellent post points out – and I don’t argue that they are. Yet it is not a true increase in diversity either. It is a veneer of diversity. I find that it disappoints me, particularly in the case of Thor, that these new heroes are presented to us only after they come to inhabit some other, established, identity – a white man’s identity. Commercially, bringing these protagonists into the role of existing, established characters (with an existing, established readership) makes sense. Comic book superheroes are not rare. It’s a crowded space into which a new addition may make barely a ripple, but change an existing member of its pantheon, and people notice. Geekdoms landslide with approbation or applause, likely both. Either way you get noticed. You get into mainstream media. And that’s good business and I absolutely understand that. In the case of Spiderman, and Captain America, and many others, I can see how the passing of the identity works. It has been long established. Many characters have taken on an heroic role: Azrael becomes Batman after the breaking of Bruce Wayne; the many iterations of The Flash (Barry Allen, Wally West, Bart Allen and beyond). I can imagine someone taking up the bow and purple cowl of Hawkeye, because Hawkeye is not restricted to Clint Barton (and Barton has played other roles than Hawkeye). When Pym retired as Ant-Man others used the technology to take on the role. Thor is different, as are Superman and The Hulk. Behind Batman’s cowl anyone can dispense vigilante justice, that’s the nature of the cowl and of the secret identity of its wearer, but as Tarantino’s Bill pointed out, Superman is not a costume. Kal-El dresses up as Clark Kent, but Superman is inextricably Kal-el. Likewise, Hulk is inextricably Banner, Thor is inextricably the son of Odin. ‘Thor’ is not a title to be passed on. God of Thunder is a role. Wielder of Mjölnir is a role. These are roles that could be given to someone other than Thor Odinson, and at times they have, and yet when Captain America (or Storm, or Beta Ray Bill) did wield the hammer, they did not become Thor. They were able to play the same role, but not to inhabit the same identity. So she has become that identity entire. And this is precisely where she sends the opposite message to the one I believe was intended. Can a female superhero not exist in her own identity, as herself? Must she inhabit the identity of a white guy before she’s gifted legitimacy? Can a woman only be heroic by taking on a male role – not just the characteristics of a male hero, but the very identity? Because if the answer to those questions is a yes, that’s a crap message. Having Sam Wilson trade in his wings for a shield doesn’t actually add diversity to Marvel, it’s just reshuffling their deck. Wilson was ground-breaking as a black superhero in 1969, and he breaks some ground now as Captain America, but it’s not added diversity. He’s not new, he’s just rebranded. Nor is he the first black man to take on the uniform. More than 10 years ago Marvel had a black Captain America in Isaiah Bradley. 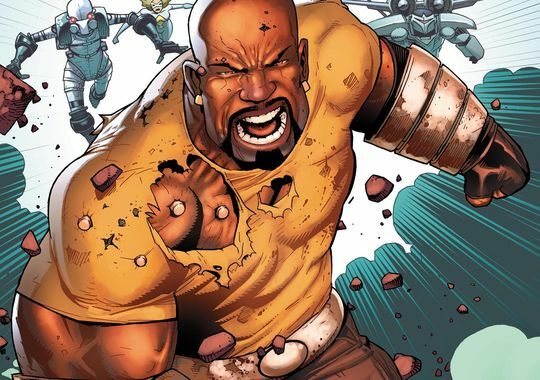 Despite Aaron’s insistence, both the ‘black Captain America’ and the ‘female Thor’ are absolutely being positioned as temporary inhabitants of these roles. Thor Odinson can reclaim Mjölnir when he is again worthy. Steve Rodgers remains in many ways the ‘real’ Captain America, training Sam Wilson in how to throw the shield and wear the stars, running the missions from Avengers mansion. An unkind reading would have this as a white master sending out his black errand boy. Both of these characters are replacements, and as such any identity they form will be in the shadows of their (white, male) predecessors, never an independently their own. To bring them in in this way is to ensure that they are less prominent even in their role because they will always be viewed through a comparative lens. Rather than having Falcon brought to prominence in his own right (perhaps as the lead in a Falcon film where Captain America plays his second fiddle), Marvel has merely swapped the colour palate for the Captain America inking. 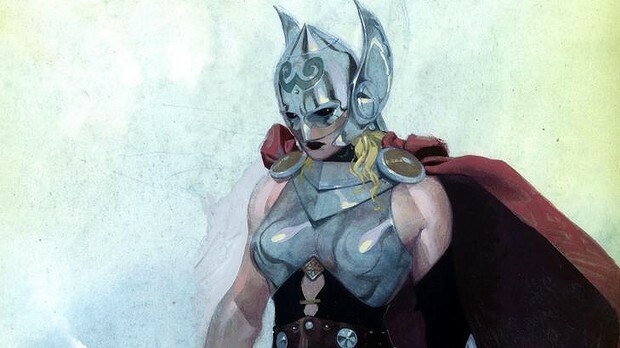 Rather than bring Lady Sif to prominence in her own right, Marvel has merely altered Thor, making a pointier breastplate prominent. I’m sure they will do more with the characters that that, they have talented writers on hand, but the criticism is there to be made. And I do support that these stories are being told. I do support greater genuine diversity of the people represented as heroes. There’s better ways to achieve this. You want an African-American hero? 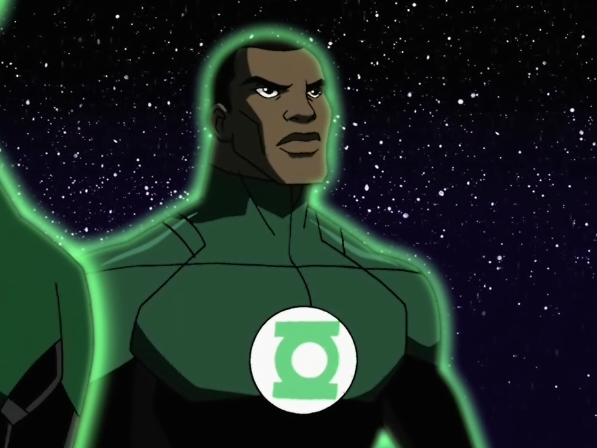 DC could do well to leave the Ryan Reynolds disaster behind and cast a Green Lantern based on John Stewart in an upcoming Justice League film (and let The Rock play him!). What better opportunity than having a woman and an African American (I know The Rock is a Pacific Islander, stick with me here) stand alongside the Kryptonian and the Gothamite? It was a noted strength of the Winter Soldier film that when Captain America (Rodgers) needed allies he turned to two black men and a woman. Diversify The Avengers? Bring Falcon onto the team. Bring Rhodey on as War Machine and give Downey Jnr a rest. Introduce Black Panther (and give him a movie of his own). Where’s Luke Cage? He has worked with Spider Man, Fantastic Four, Iron Man and Hulk and could appear in any number of franchises? (The Rock again? Or Idris Elba? Just don’t cast Nicholas Cage to play the Harlem-raised African-American). Would these suffer from the accusations or the reality of ‘side-kick spin-off’ syndrome? Perhaps. So take a character who’s no one’s side-kick. You want a female superhero throwing lightning around and kicking arse? Storm! She’s established and portrayed in film by an Oscar winner. She’s a female of colour. She has worked with The Avengers before. If Wolverine can have an origin, why not Storm? Want a woman hitting hard with a divine hammer? Have Ms Marvel take up Mjölnir, or Brunnhilde the Valkyrie. Have Jane Foster pick up the hammer when Thor’s knocked down. Who wouldn’t want to see Natalie Portman with Mjölnir in hand? Have a new female character (Asgardian or otherwise) wield it. There’s no shortage of Norse myth to plunder. Have Frigg and her attendants as a team of female heroes. Gender-swap Vidar and have a Goddess who can stand beside Thor with the strength to rip Fenris’s jaw asunder with her bare hands. Have Tyr become a one-handed Goddess of single combat. Imagine if Nanna swore revenge instead of pining her way to an early death in grief at Loki’s murder of her husband. Powered by her need to avenge Baldr the (now former?) Goddess of Peace could oppose Loki, could ignore Thor’s calls for restraint or mercy, could be a narrative grenade tossed into the halls of Asgard and the world of men. She could renounce her reign of peace and unleash violence of divine proportions. She links to existing canon in that she is fighting an existing antagonist. She could draw on the tradition of moon goddesses, a new Diana hunting through the Marvel universe. Thor could cameo to plead with her for his brother’s safety, and she could shrug him off as a weak-willed and overly sympathetic fool. She could take Mjölnir from him, not received as a gift, but taken as her right, and in a rage she could wield it against her foes. That’s a kick-arse female hero I want to read more about.